This is slowly turning into a baking blog. Can you tell that baking was my first passion in the kitchen? It’s still what I’m most comfortable doing (although I love being in the kitchen period). Anyway, I heard about this pie contest for Pi day via Serious Eats on Monday. I instantly decided to enter and started to brainstorm pie ideas. Although I love baking, pies have never been my forte. I’ve never been a big pie eater, so I’ve never had a serious interest in making them. 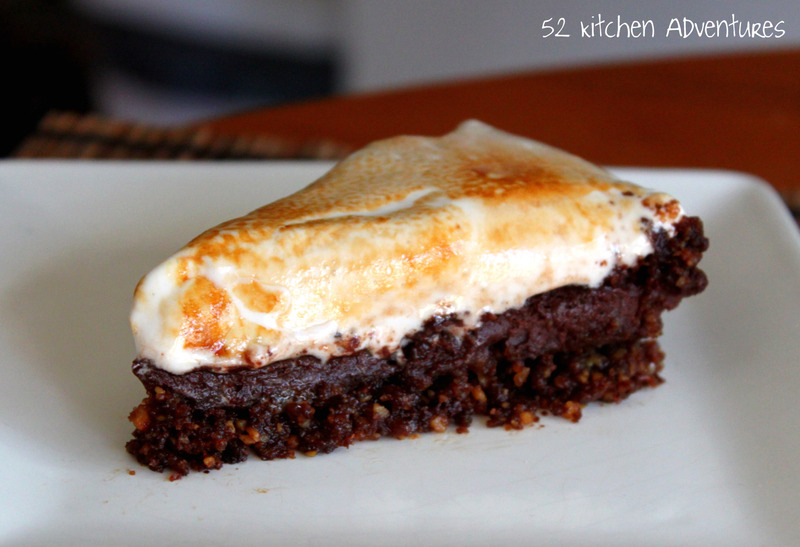 Graham cracker crusts are less intimidating (and more delicious in my opinion) than dough crusts, so I went from there and developed an idea for an “adult” version of s’mores. The product? A salty, buttery graham cracker crust with toasted walnuts, rich bittersweet chocolate center with Guiness beer, and homemade marshmallow. This isn’t your childhood s’mores. 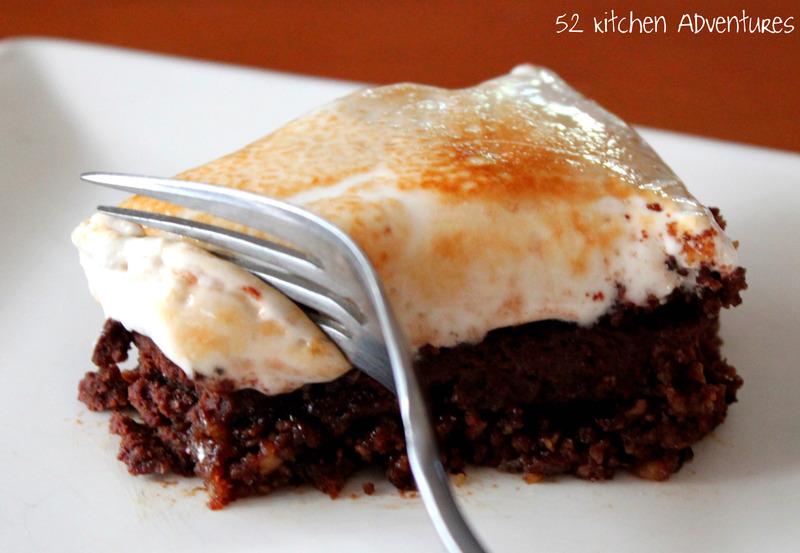 It’s a rich, decadent, indulgent, mature version of the classic dessert. Plus, it’s just in time for St. Patrick’s Day! Preheat oven to 300°F. Spread walnut pieces on a baking sheet. Bake for 12-15 minutes, until lightly browned and aromatic (watch carefully, they burn quickly!). Place toasted walnut pieces in food processor with 3 T of the brown sugar. Blend until finely chopped. In a large bowl, whisk nuts with graham cracker crumbs, remaining brown sugar, and salt. Pour melted butter over this mixture, and mix with your fingers until everything is well combined. Press evenly into a greased 10-inch glass pie plate. Bake crust 10-12 minutes or until lightly browned. In separate small saucepans, heat cream and beer over medium-low heat, stirring somewhat frequently. Place all the chocolate pieces into a large bowl. Once the cream and beer are both very hot (don’t let them reach boiling), pour over the chocolate. Let sit for a few moments, then whisk together until all the chocolate is melted and the mixture is smooth and creamy. Add eggs and dash of salt, whisking to combine. Pour over pie crust until pan is 1/2-3/4 full. I had about 3/4 C leftover, so I poured it into a ramekin and baked it alongside the pie. 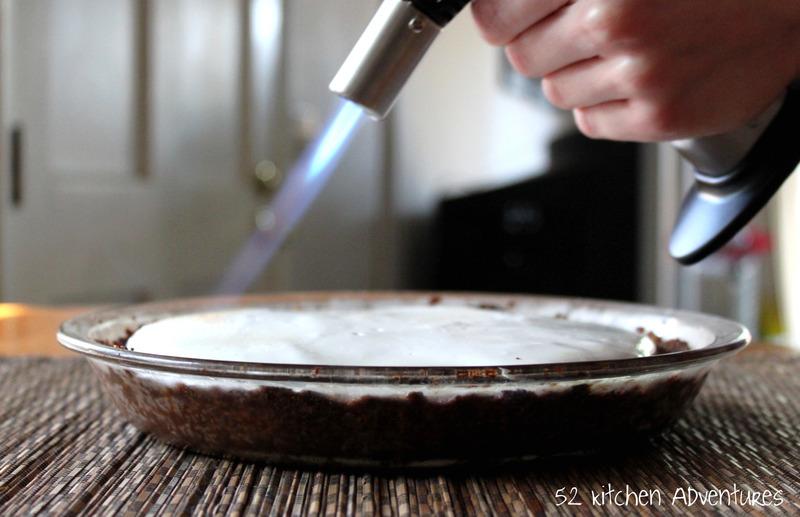 Cover the exposed crust with aluminum foil and bake pie for 20-25 minutes, or until center is set and doesn’t jiggle much when shaken. Let cool completely (about 1 hour) before making the marshmallow topping. You can cheat and use store bought marshmallows, but I can’t speak highly enough of this recipe. 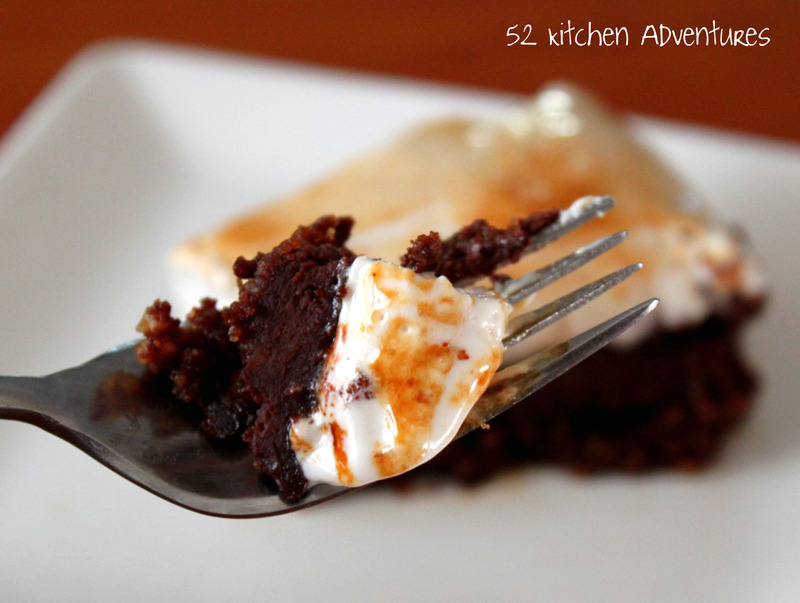 It’s surprisingly easy (you just need a candy thermometer and, ideally, electric beaters). I’d never made homemade marshmallows before this, but I don’t think I can go back to store bought now! In a small saucepan, combine 1/4 C cold water, corn syrup, sugar and pinch of salt. Whisk together over medium heat. Once sugar is dissolved, let sit unstirred until mixture reaches softball stage (around 235-240°F). While sugar mixture is boiling, sprinkle gelatin over remaining 1/4 C cold water in a large, deep heatproof bowl (a stand mixer bowl is perfect for this). Let stand for about 1 minute, until it softens. Beat this at medium speed. Once sugar mixture reaches softball stage, remove from heat and carefully pour into gelatin, avoiding the beaters and sides of the bowl. 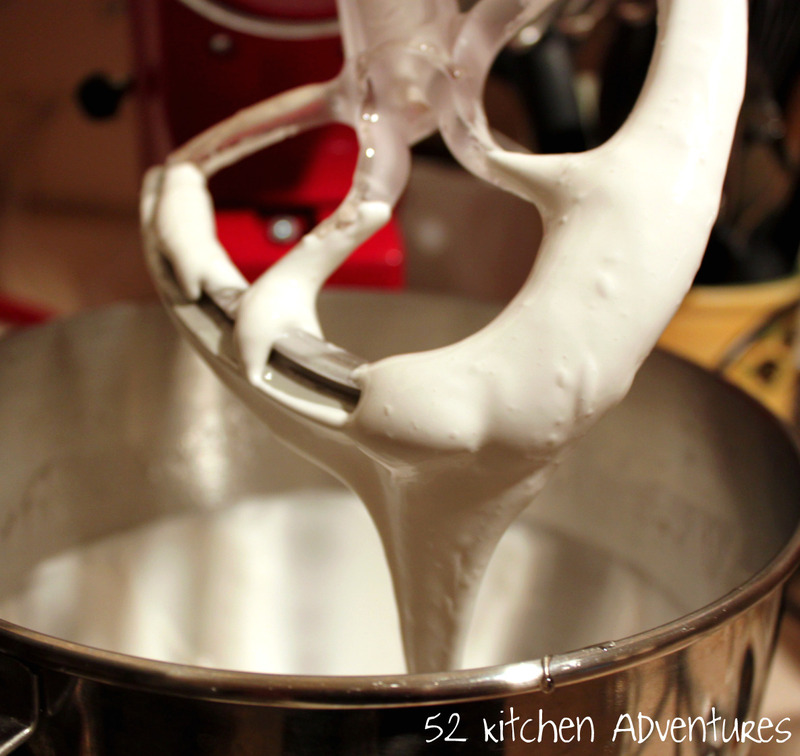 Immediately begin mixing on high speed, for 5-8 minutes, until mixture increases in volume and turns white and thick. Add vanilla and beat for a minute more. 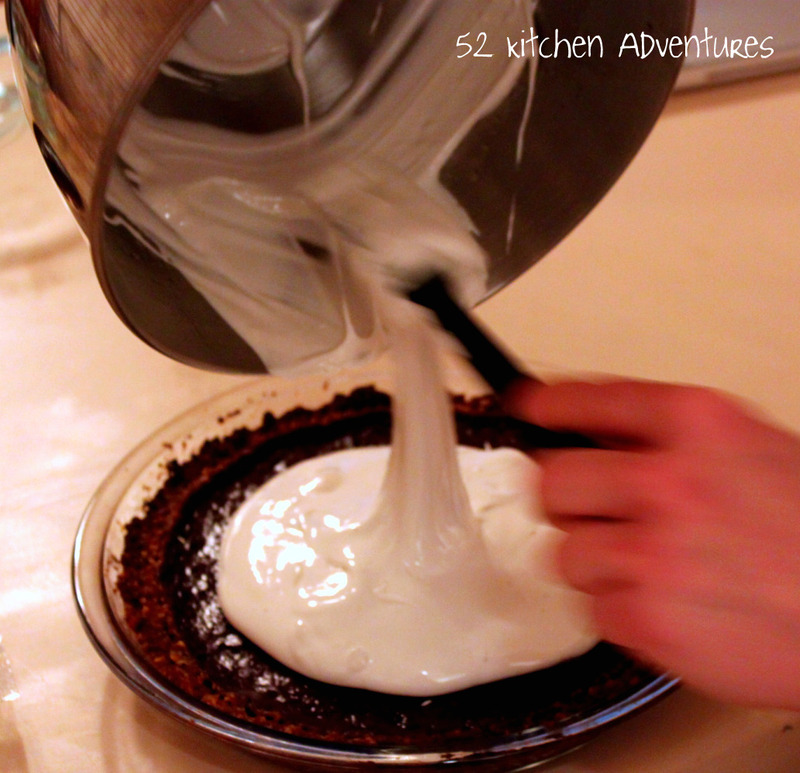 Pour marshmallow topping onto the center of the pie, scraping the bowl with a spatula. Filling will spread over pie, but use spatula if you need to cover some areas. Chill uncovered for 1 hour. Then loosely cover pie with aluminum foil and chill for 3 more hours. You can let it sit overnight if you don’t want to serve it immediately (wait to brown the top until you want to serve). When you’re ready to serve, brown the top either using a creme brulee torch or by putting the pie under the broiler (cover the edge with foil first so the crust doesn’t burn!) for 2-3 minutes. If you do it under the broiler, don’t take your eyes off the pie or it may burn. Let cool 5-10 minutes if you can wait that long before eating. Keep a damp towel nearby to wipe your knife between slices. Ah it took me a minute to figure out who you are! That cake sounds interesting and yummy. Glad you’re enjoying the blog, it’s been a lot of fun so far! My mouth is watering! Thanks for sharing – looks fantastic! This is awesome! I bought Guinness for stew for St. Patrick’s Day, but I don’t like beer, so I need ways to use it up. I WILL BE MAKING THIS. How do you use store-bought marshmallows instead of homemade ones? I might make them homemade, but I don’t have a thermometer or anything. You could use store bought marshmallows by lining them up evenly across the top of the pie, then browning them by the recipe instructions. Probably mini marshmallows would work best, unless you want a big layer of marshmallow. Let me know how you like it! Next make your own Peeps!! If I didn’t lack both a food processor and a mixer in my “pretending to be an adult” kitchen, I’d be making this immediately. Looks delicious! Plus I love Guinness. Wow! This makes my diet so not easy! It looks delish!